One of the elements of a divorce that makes it so complicated is the amount of paperwork involved. The documents need to be filled out properly and just one mistake can lead to a number of problems down the road or the court actually rejecting the case filing. This can set you back time and money. In order to decrease costs, you can hire a mediator to complete these documents for you in addition to facilitating the negotiation of disagreements. The mediator is able to draft and then file all of the court documents that are necessary. He or she is very familiar with all of the paperwork involved and the procedures that are necessary to file the correct papers in the right way with the courts. When you work through a mediator all of the information you have more control about the information is presented in the documents so this maximizes your privacy and confidentiality. When you are working together in mediation you won’t have to make any court appearances. Instead, you will be working things out in a neutral environment that is safe and completely respectful. Once the couple has worked out issues such as the division of assets, finances, debts, spousal and child support, a Marital Settlement Agreement is drawn up along with the other necessary court documents. This paperwork is then filed at the courthouse and the end result is your final divorce decree. When you use a mediator you can completely avoid any stressful court appearances. 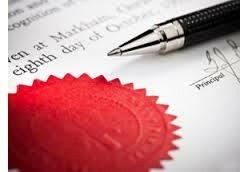 All court documents become legal and binding once signed by both parties. When the signed and approved Marital Settlement Agreement has been filed by the mediator, the judge needs to sign it to make it an Order of the Court. Once this is done the judgment is legally binding until you mutually want additional changes. When you use a mediator you will not have to hire a lawyer since you will be working things together along with the help of a neutral third party. Using a mediator will cost roughly 20% or less of what you would have to pay two lawyers. When you are dealing with the stress of the divorce or separation, you won’t want to also deal with the financial hardship of paying high lawyer fees in an adversarial contest. The mediator can work on your behalf to make sure that all court documents are properly filled out and filed. The end result of working with the mediator will be a legal divorce. This divorce will be just as legal as if you had used a lawyer and went through the court system to get it. The only difference is you will have had a say in the outcome instead of leaving your future in the hands of a court judge to decide. This is the reason why so many people are turning to mediators to facilitate their divorce.